In the sixteenth century, the French were easily intimidated by Spanish sea power. They decided that they would settle far away from the Spanish threat in the area we now know as Canada. The first French in this area spent most of their time looking for gold and silver, but they did not have much luck. The area was very inhospitable, plagued by short summers and long winters that only provided enough time for a short growing season. So when in 1541, the French attempted to colonize along the St. Lawrence River in Canada, the Spanish emperor said they could have it because as far as he was concerned it was of no value. He was quickly proven right when the first colony was defeated by freezing cold, scurvy, and hostile Indians. However, all was not wasted, the French colonists discovered the commodities of furs and fish. Soon afterward, they set up a trading post in Tadoussac at the mouth of the St. Lawrence River, making alliances with many of the surrounding tribes. These tribes included the Micmac, Montagnats, and the Algonkin, and they supplied the French traders with a steady stream of beautiful furs. 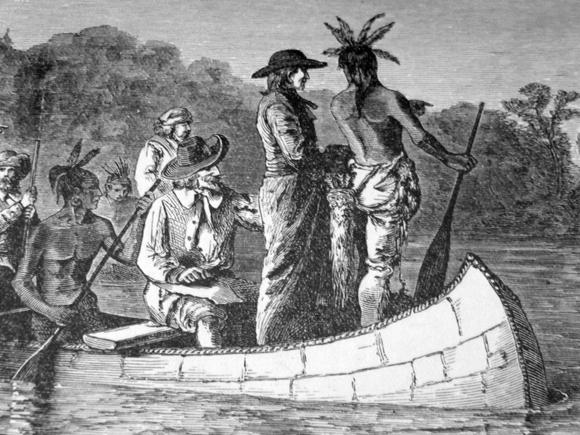 Until 1663, Canada was owned by the fur-trading Company of New France, and they were not interested in colonizing the area. The population of the area was increasing, it went from 700 people in 1650, to only 3,000 people by 1663. Soon, the French crown began to worry because they were losing the race to colonize the New World. After all Spain was taking a fortune in gold and silver from its colonies. Only 12% of the French colonists were women. Consequently, the French government, launched an incentive program. They recruited girls from the various orphanages, and then gave them a cash dowry. In return for the money, the French orphans were expected to marry within 3 weeks of their arrival in Canada. Most of the men arrived as indentured servants, and they were called engages. The engages arrived in the New World in servitude. Once in Canada the engages were purchased by people who could afford to pay off their bill of passage by putting them to work. The indentured servants normally worked about 3 years before their bill for their passage to the New World was paid in full. Almost 2/3rds of them returned to France as soon as their bill had been paid. In the seventeenth century the economy of France was horrible. Reoccurring famines were killing thousands of people, but no matter how bad it got the French didn't want to live in the freezing cold weather of Canada. The majority of the French emigrants settled along both sides of the St. Lawrence River, and after a while, the standard of living got a lot better. People lived on both sides of the St. Lawrence River in whitewashed homes, complete with barns and windmills. They grew grains and raised livestock, but were to far removed from everyone else to thrive from exporting goods. For the majority of the French that did emigrate to Canada, it was a good move. They learned to adapt to the cold temperatures and they each received at least 100 acres. In addition, they were eating meat and bread which were 2 things that they wouldn't be eating if they had stayed in famine prone France. Finally, by 1700 they were at peace with the Iroquois Indians. The peace brought a great increase in prosperity and the population swelled form 15,000 in 1700 to 51,000 by 1750. As a result, wheat production tripled and so did the amount of mills.